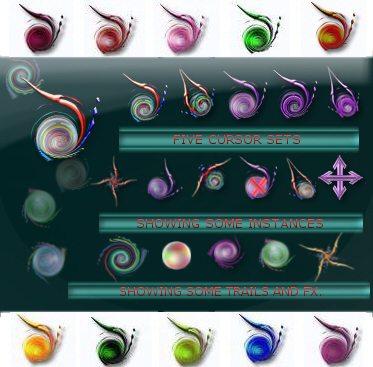 Here is a complete and configurable *Kurio* cursor pack with very rare design style. The download file of *Kurio* pack contains 5 exciting themes based on same template, Matching Fx for mouse down, up, doubleclick,midclick and R-click, Matching Trail particles and animated Trail followers, matching sounds for L-click, R-click, mid-click and d-click, Readme.txt and ColorMe.txt. The cursor is full of animations. Each instace has its pressed state. You can color the cursor easily to match up with anything you want. I have given my top 10 preset statistics so that you can color it quickly. The cursor looks good with shadow and some of you may like it in about 75% of size.